Lyme disease is a well known tick borne disease in humans and dogs. Both species become infected with Borrelia burgdorferi during the feeding off the host by the tick. Pets travel with their owners and may become exposed to ticks not commonly found in their own living environment. The peak times for infestation depends on the weather. Most people fear tick infestation in the spring and summer months, though some ticks are found on pets during this time, adult deer ticks which spread Lyme disease are more active in cooler months, from October through March. Female hard ticks deposit a single, large clutch of eggs in the environment. Within weeks to months, depending on environmental conditions, the six-legged larval stage hatches from the egg. The larva must then find a host, feed for several days, and then drops to the ground and molts to an eight-legged nymph. The nymph then finds an appropriate host and feeds for several days to a week. Once the nymph has engorged, it drops to the ground and molts to the eight-legged adult, which then must find a third host. Adult hard ticks may mate on all species or off their host such as the Ixodes spp tick which carries Lyme disease. Once mated and fully engorged, the female will detach, crawl to a suitable environmental location, lay a clutch of several thousand eggs, and then die. When the tick bites it may cause irritation and pruritus around the attachment site. Tick -borne toxicoses can develop due to the localized inflammation, allergic hypersensitivity, or severe toxic reactions. It is during this attachment the Ixodes tick transfers the spirochetes of Lyme borreliosis. Other symptoms of Lyme disease are high fever, muscle weakness, shifting leg lameness and lethargy. To protect your dog against Lyme disease it is advise to use a safe and effective tick repellent and preventive product. These products should be used monthly year around for adequate protection. Our animal hospitals carry K-9 Advantix, Frontline Plus and Nexgard. All of these products are safe for your pet. Our veterinarians will discuss what products are best for your pet. Having your dog vaccinated against Lyme disease is also recommended because for a the topical or oral tick preventive to be affective if must be used effectively and consistently. Both the Macomb Pets Ahoy Animal Hospital and the Waterford Pet Authority Animal Hospital have the Lyme vaccine available to administer to your pet. Make your appointment today to protect your pet against Lyme disease. Cats and dogs are capable of hiding symptoms of illness. This is an instinctive behavior protects them against predators or the dominant animals in their pack. It is not until the pet becomes critical and displays symptoms that client becomes aware their pet is sick. A pet may be suffering from a fever, enlarged lymph nodes, gastritis, internal bleeding or a clotting disorder which would not be detected by an untrained eye. Most commonly the pet’s medical problem goes undetected until the pet stops eating, develops diarrhea or starts to show bruising on their skin. It is at this time the owner calls a veterinary hospital for appointment to see their pet. If a cat or dog has an underlying medical issue at the time a vaccine is administered the vaccine could jeopardized their ability to recover from the illness. An exam performed by a veterinarian will determine if the pet is healthy prior to administering a vaccine. Some adverse reactions to vaccines may be spiked fevers, vomiting, diarrhea, lethargy, anaphylactic shock and death. Treatment for patients suffering from adverse reactions to vaccines may include veterinary clinic hospitalization, IV fluids, medications for shock, oxygen therapy and plasma transfusion. As a precaution to avoid adverse reactions veterinarians should be perform a thorough exam prior to administering a vaccine. Just as MD’s who exam, diagnose and treat people, veterinarians attend 8 to 12 years of college which enables them to know how to exam, diagnose and treat all medical conditions that effect pets. Pet examinations are necessary to diagnose illnesses, prescribe correct medications, perform laboratory tests and provide preventative pet health care. Clients are charged a minimal fee for their pet’s examination which requires the veterinarian’s knowledge, expertise and time. This post will mark the conclusion of my time as the author of the Pet Authority’s Official Blog. I’ve had a fantastic time writing for all of you that have been following loyally. You’ve been an inspiration and a tremendous gift. I’ll share a few links with you today to help you find some of the better sources of veterinary knowledge on the internet. If anyone has a suggestion, send it to me via a comment. I will continue to monitor the blog for comments on any of the posts. We’re not shuttering the blog completely, we’re just not going to be offering any new content here on wordpress. The hospital will have a blog as part of our web page, which you can find at petsloved.com. There are more than 1300 articles and videos on the new website that you can view, print, etc. There will also be some daily news items there as well as a link to our Facebook. Once again, you have my deepest gratitude for all that you helped the blog become. Veterinary Information Network’s Veterinary Partner Site Here you will find a ton of articles about all kinds of diagnoses and conditions in pets, authored by vets and vet techs. Animal Health SmartBrief: This is a daily news aggregator that will email you the top stories in animal health news. This is where many of the Thursday News posts came from. You do have to sign up with your email address, but you will only get 1 email a day, with an occasional extra story sent separately. It’s really not spammy at all. Veterinary Surgery Central : This is a page authored by a local surgeon. He’s a stellar vet and there is a ton of great info here. Today’s news story is from Detroit metro airport. They’ve installed an indoor dog bathroom for service dogs and working dogs. Here’s the full story from the Freep. Does Brushing Teeth Really Help? I’d like to share some photos of a success story with you today. A few images will make a bigger impact than tons of text, so let’s get right to it. This is Macy. Macy’s mom brushes her teeth every day. Macy’s teeth look -great- because of the attention mom gives them. She won’t need a dental cleaning this year, and if mom keeps up with brushing as much as she does now, she won’t need one next year, either. There’s just a little bit of staining on that big premolar tooth toward the back of her mouth, but there’s no gingivitis, so we can leave that be. Yes, brushing really does make a huge difference for almost all pets! Congrats, Macy! You’ve got a nice white smile! Questions about dental care? Ask by leaving a comment! Today’s news article deals with a species that we don’t see at our practice: horses. I’ve long said, jokingly, that horses are 1200lb cats, but in this case, there’s a very striking similarity. When it comes to recognizing pain in cats and horses, they’re a tough read. A group of researchers have developed a way to recognize pain in horses that I thought was pretty neat. Have a look at how they did it here. Remember that slogan? Back in the days of VHS tapes for rent, the rental stores would put a sticker on the tapes to remind renters to rewind. That way, the next renter wouldn’t have to do so before watching the movie. The advent of DVDs rapidly put the rewind campaign out of commission. This week, I’d like to suggest that we resurrect that slogan and put it to a new purpose. Wind-out leashes. I’m sure I’ve gone on this rant before, but it bears repeating. Explicitly stated, wind-out leashes are dangerous to dogs and people. They don’t protect dogs from other dogs or unsafe spots (like the road). The danger to people comes from the cords being wrapped around limbs or objects in the environment. Those leashes are a nightmare in our waiting room. I’ve never seen a dog under good, safe control with a leash that’s 15′ long. In an environment where pets may be scared or sick, or there are dogs and cats, kids and strange people, normally well-behaved dogs may not behave well. When an incident happens, precious seconds are lost trying to get the leashes to rewind. Lastly, those leads are horrible for good training strategy. I had a chance yesterday to speak with one of our excellent local dog trainers. The consensus was simple: those leashes are a bad idea. If you’re still not convinced, here’s another long article discussing wind-out leashes and the approaches that some communities are taking to address their concerns. It’s far easier to remember the slogan, though: Be Kind, Rewind! When I was in high school, my biology teacher and mentor got involved with a long-running student project that was studying the after-effects of the Exxon-Valdez oil spill. By the time that I got involved, the project had expanded beyond the Valdez spill to encompass a look at conservation and natural resources all over the state. I spent a bit over 2 weeks there for each of three summers. The trips were amazingly cool and I fully intend to get back to Alaska some day. Today’s news article is a look at the spill after 25 years. Oil is STILL present in the spill area even after all this time. While that’s NOT shocking, it IS a major wake-up call about the impact we are having on the world that is going to have to sustain us in the future. Here’s an article from the Freep that talks about how much pet owners are spending on their pets. There’s a neat breakdown on the different areas of spending. I’m happy to see that the two most important things are food and veterinary care — right where it should be! 🙂 Owners are making healthier choices in foods and care, which is great. Click through to the full article. Today’s link is a short article that talks about the importance of an annual vet visit for cats. While just about all vets will acknowledge that cats can be very difficult for everyone involved, we all feel that the benefits outweigh the trouble. There’s some good advice on making the trip better in the article, too. Science is a funny thing sometimes. We get excited about being wrong just as much as being right. The way we study things allows us to gather good, helpful data from something that doesn’t work or isn’t how we thought it was. Rather than repeat the entire article I want to share this week, I’ll start by saying that it’s about a recent discovery in the canine eye. It has implications for human health, and it causes doubt in our belief that dogs don’t have very sharp vision. It caught my attention because we’d talked about and given examples of how dogs and cats see the world. Turns out that it may not be entirely correct! 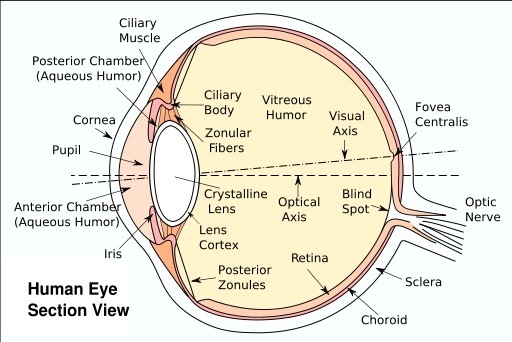 Here’s a labeled diagram of an eye to help you with some of the anatomy mentioned in the article.